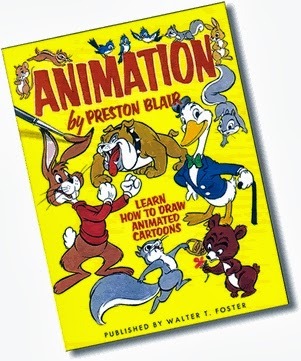 As a kid, this was my first source for learning how to draw animated walks, runs, jump, etc, was from Preston Blair's Animation book. He wrote this book awhile ago, but its full of great insight into cartoon animation. Here's a rough animated jump I learned from Richard Williams book which is more of a realistic character jump. As I was figuring out the jump, I notice a few things. One is that the character's head moves in a similar way when a ball goes up, arcs over and falls back down and there's a lot of squash and stretch in the poses. The line of action is an imaginary line which goes from the neck, down the spine and to the legs to define the pose of a character and its attitude. Animators often will rough in this line first to keep the attitude or action of a strong pose. Below is the same jump but I've added a red line of action. When you are figure out your Key poses, you will often draw this line to make sure your character is moving the right way from pose to pose. Here's the jump, one more time, showing just the line of action. Even without the details you can still see the same motion. As you can see, my character has landed to the far right side of the screen in the establishing shot. I have now changed my framing to a Close Up in order to see what he thinks. To set up the next shot, I animated this guy to do a "take". The cartoon take is in almost every cartoon, however is lacking in modern animated tv series like "Family Guy". The king of the cartoon take in my opinion is Tex Avery and if you don't know his works, click here to see a classic. Take a look at this take and see what you think? Anything look odd to you? The above video has a mistake in the animation. Can you spot the problem? I know its rough. Add your comments! I know people are looking at this blog from all over for some reason. Please let me know you exist, is the comment button working at all?